Case interviews are simply word problems based on real client projects on which the interviewers themselves have worked. The interviewer will be assessing you on several areas that characterise a good consultant, that can be summarised in your ability to solve problems and translate solutions into actionable insights for clients. First 15-30 minutes: Fit Interview, assessing your motivation to be a consultant in that specific firm and your leadership and teamwork traits. Learn more about the fit interview on our fit interview article. Last 5 minutes: Fit Interview, again. This time it’s about your questions for the interviewer. Both the Case and Fit interviews plays a crucial role in the finial hiring decision. There is no “average” between case and fit interviews: if your performance is not up to scratch in either of the two you will not be able to move on to the next interview round or get an offer. Focus: Since interviewers in the Second Round tend to be more senior (usually partners with 12+ years experience), they will be more interested in your personality and ability to handle challenges independently. Some partners will literally drill down into your experiences and achievements to the extreme. They want to understand how you react to challenges and your ability to identify and learn from past mistakes. 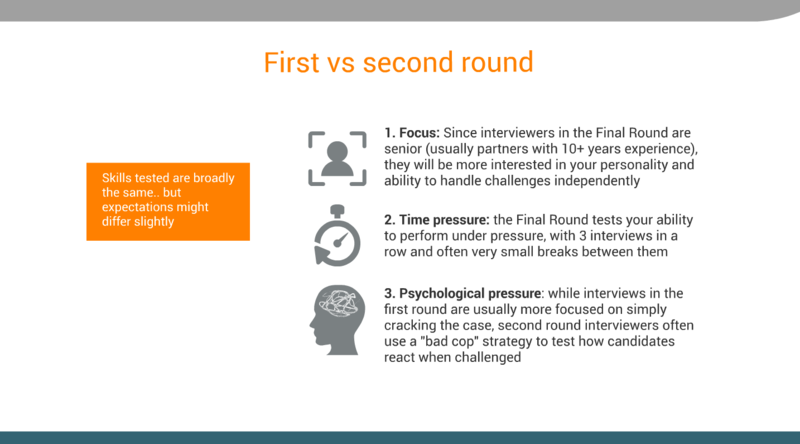 Psychological pressure: while interviews in the first round are usually more focused on simply cracking the case, second round interviewers often use the "bad cop" strategy to test the way candidates react to challenges and uncertainty. Is there a difference between McKinsey and other firms? Most cases test your ability to crack a broad problem, with a case prompt often going like: "How much would you pay for a banking licence in Ireland?". You, as a candidate are expected to identify your path to solve it (structure), leveraging your interviewer to collect the data and test your assumptions. But McKinsey interviews, especially in the first rounds are slightly different, with the interviewer controlling the pace of the conversation much more than in another case interviews. Easentially your interviewer will ask you a set of pre-determined questions, regardless of what your initial structure is. You will have to understand the problem, come up with a mini structure, ask for additional data (if necessary) and come to the conclusion that answers the question. Essentially interviewer led cases are big cases with lots of mini-cases within them. The method you have to follow is basically the same as in the standard (or the candidate led cases), the main difference being that instead of solving one big case you are solving several mini cases. Estimates, i.e. being able to combine the “guess factor” and the quantitative factor to come up with reasonable estimates of unknown facts. Example: How many bank branches are there in Italy? Business analysis, i.e. understanding how a business makes money, what is its value proposition to its (existing and potential) customers and how it compares/competes with other players. Several cases will include elements of market entry, new product development, pricing that broadly fall into this category. Example: Should we export our peanuts butter to Tunisia? Profitability, i.e. understanding the key drivers that enable a business to make (or lose) money: revenue and cost base (e.g. is it a fixed cost-business like an airline or a variable cost business like a grocery?). Example: Despite steady growth in customer flow, Walfort supermarkets has seen its profitability declining over the last year. What is the reason of such decline? As a matter of fact, each case will include a one or more the three above common topics. Skills required in a consulting interview? We know revenues have declined. This could be due to price or volume. Do we know how they changed over the same period? Did customers change their preferences? Which segment has shown the decline in volume? Is there a price war in the industry? Structuring means creating a framework, i.e. a series of clear consecutive steps in order to get to a solution to the problem. The focus of a framework (and of the whole case in general) is not on the solution itself but rather on how to get there. This is the trickiest part of the case interview and the main reason for candidates failing the case interview. Millions were made by selling books describing 10 or 12 standardised frameworks, which were said to be the passkey to solve virtually any case on earth. Unfortunately this approach simply does not work, for a few reasons. First Consultants are not naïve enough to hire people who are just good at memorizing 12 schemes, second because you are expected to think exactly in the same way a real consultant would do in a real case. And, since no consultant uses pre-packaged frameworks in real projects (feel free to ask all your friends in consulting), do you think they expect you to use them in an interview which is set to represent as closely as possible their work? Proper understanding of the objective of the case. Ask yourself: "What is the single crucial piece of advice that the client absolutely needs?" Identification of the drivers: Ask yourself: "What are the key forces that play a role in defining the outcome?" At first sight this concept looks pretty intuitive. However this is a radically different from the typical one-size-fits-all framework approach, trying to force-fit a random framework into a case. Let’s understand why with a simple case question. Our client is PharmaCorp, a Dutch pharma company specialized in researching, developing, and selling “small molecule” drugs. This class of drugs represents the vast majority of drugs today, including aspirin and blood-pressure medications. PharmaCorp is interested in entering a new, growing segment of drugs called “bionics”. These are complex molecules that can treat conditions not addressable by traditional drugs. R&D for Bionics is vastly different from small molecule R&D. PharmaCorp wants to jumpstart its biologicals program by acquiring BioHealth, a leading bionics startup from the Silicon Valley with a promising drug pipeline. Should PharmaCorp acquire BioHealth? Check out the difference between the standard framework-based approach and our Problem-driven Structure. Prioritising: Can you tell a relevant from an irrelevant fact? Connecting the dots: Can you connect new facts and evidence to the big picture? Establishing conclusions: Can you establish the right conclusions without rushing to conclude facts not supported by evidence? Analysing data: extract data from graphs and charts, elaborate it and draw insightful conclusions. Solving business problems: translate a real world case to a math problem and solve it. As in the real consulting life, coming up with the best ideas in a case interview is necessary, but not enough: you must be able to turn it into a compelling recommendation. Otherwise your days and nights of hard work have been totally wasted. Top down: A CEO wants to hear the key message first, and then, if and only if she finds it useful, she’ll ask you to provide details. Always think about what is absolutely critical for the CEO to know, and start with that. You can read more on our section about the Pyramid Principle. Concise: This is not the best time for boiling the ocean or going through an endless number of possible solutions. Consultants want a structured, quick and concise problem recommendation they can implement the next day. Fact-based: Consultants, as CEOs hate opinions based on gut feel rather than facts. They want facts first, to make sure you are in control. Always back up your conclusions with the RELEVANT facts. The key is decoupling problem solving, business concepts and analysis tools to achieve the necessary modularity to apply the same method to solve any case. The synergic action of these three elements will allow you to tackle any problem. Let's look at these in more details. MyConsultingCoach’s Problem Driven Approach is a universal problem solving method that can be applied to any business problem irrespectively of its nature. 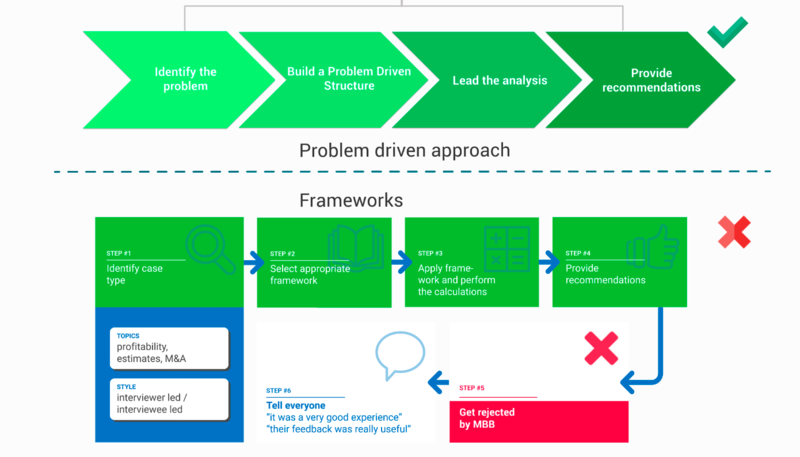 It is a simplified version of the roadmap McKinsey consultants use when working on engagements. The canonical 7 steps are simplified to 4 as the analysis required for a 6 months engagement is clearly different from that of a 45 minutes case study. However, the underlying flow is the same. Let's look at it. 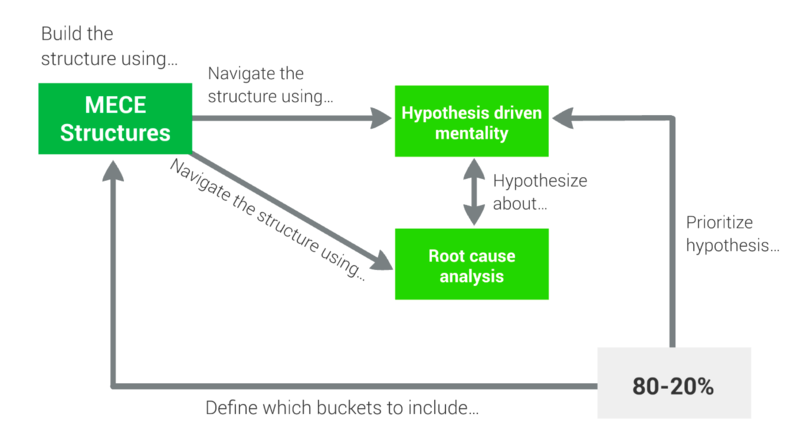 In our video on Identifying the problem, we will learn how to apply a structured hypothesis driven approach to quickly circumscribe the key issues the client is facing. We will cover all aspects of the initial part of the interview, from taking notes, to engaging the interviewer with the right questions to formulating an insightful hypothesis. Once you identify the problem you should move on to structure it by developing a custom tailored structure, exactly like real consultants in real life. It will require deeper thought from you, but it will ensure you tackle the right problem, provide a relevant solution and come across as a pro at solving case or any other problems! Creating a structure involves breaking a problem down in smaller sub-problems which are usually represented using issue trees, allowing the visualization of the dependencies between sub-problems. How do you build a problem driven structure? 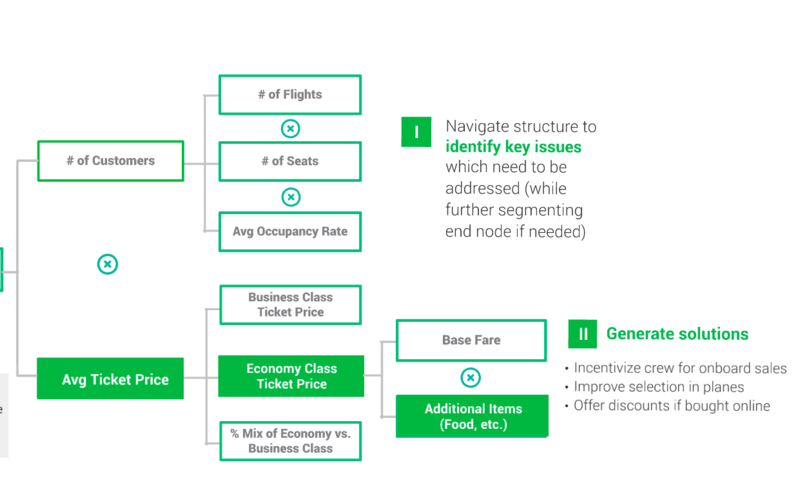 Let’s look at an example – airline revenues can be broken down as number of customers multiplied by average ticket price. The number of customers can be further segmented into number of flights times number of seats times average occupancy rate. Similarly, the node of average ticket price can be broken down further. A good structure has several requirements like MECE-ness, level consistency, materiality, simplicity and actionability. You could use several approaches to segment the problem – a mathematical vs. a standard approach; an hypothesis or an issue based approach. Beyond this, there are also several segmentation drivers also to choose. First, we navigate our structure to identify the key issues which need to be addressed (while further segmenting the end node, if needed). 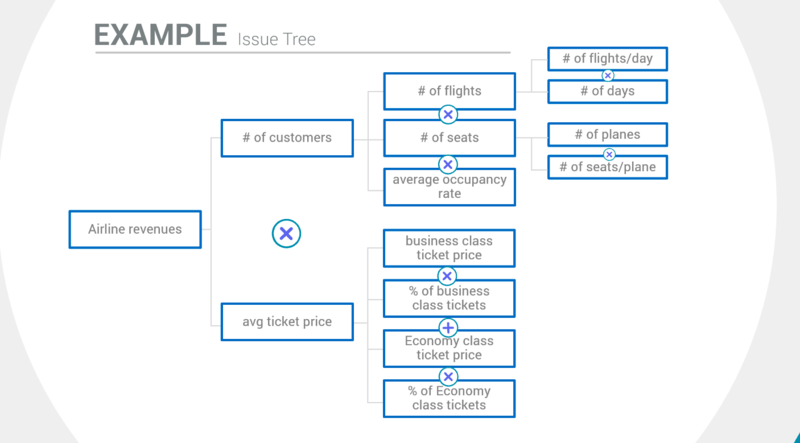 In our airline example, we could find the average ticket price to be a key issue. We would then look at its drivers and find that the problem is in the Economy Class ticket price. We could then further segment it. Once we’ve done this, we move on to generating solutions tailored to that end node, which in this case would be incentivizing crew for onboard sales, improving assortment in plane or offering discounts for online purchases. Our “lead the analysis video”, which lasts well over an hour, will guide you through the process in detail. Recommendations need to be communicated in a top down way. 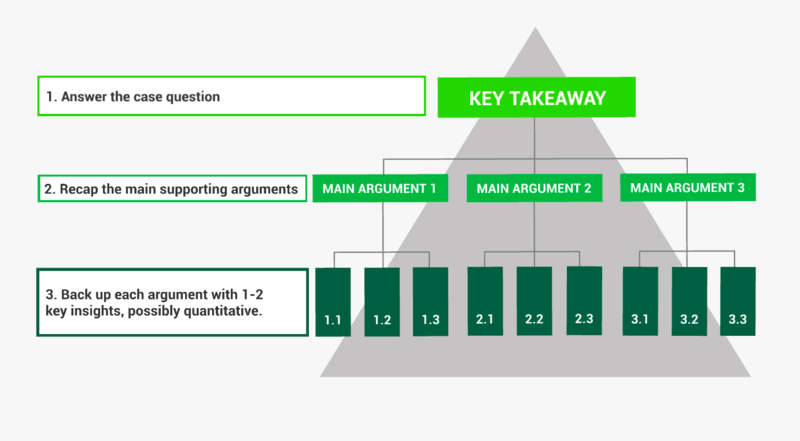 You need to deliver a one minute, top-down, concise, structured, clear and fact-based summary of your findings. When building your structure you’ll come across some familiar themes again and again, recurring concepts which make businesses tick – profit, prices, valuation, market sizing, and more. These are what we call building blocks. Building blocks are not frameworks. Frameworks are plug-and-play solutions which tend to be force-fitted to cases. The framework approach is too fixed and does not allow much room at all for customization. With this method, you would typically start by identifying the case type along a number of dimensions such as topic (profitability, M&A, market entry), interviewer stance, company and so on. Then, you would move on to selecting the appropriate framework, apply it, perform the calculations and give an answer. This is not what a consultant does when she gets to the client's site at 9am (more often than not at 7am). Instead, she will break problems down and find solutions quickly, efficiently and, more importantly, creatively. Make sure you do the same in your case interview. Let's take a break from all this theory and look at what to do to prepare efficiently and effectively for your case interview. Timeframe: clearly time will affect you preparation. We usually advise our clients to prepare for around 60 hours, obviously the more practice you get the better it is. It is similar to an S-curve. For solitary preparation, perhaps one of the best uses of your time is to work on your mental mathematics. This skill is neglected by many applicants much to their immediate regret in case interview. Find our mental math tool here or in our course and practice at least 10 minutes a day from day one to the day before the interview. Once you covered our Building Blocks (week 2), then you should start working through the cases in My Consulting Coach's case bank alongside your work on the course. To build your confidence, start out on easier cases, work through with the solutions and don't worry about time. As you get better, though, you can move on to more difficult cases and try to get through them more quickly. You should practice around 8 cases on your own to build your confidence. This step is optional, but very useful. The most effective way to prep for a consulting interview will always be to get help from someone who has worked as a consultant for a top firm. Nobody else will be able to spot your weaknesses as quickly or offer better advice to deal with them. Of course, you will never be able to secure the time of these individuals for free. However, it is worth considering the difference in your salary over even a just few years between getting into a top tier firm versus a second tier one. In the light of thousands in increased earnings, getting expert help is one of the best investments you can make for your own future. 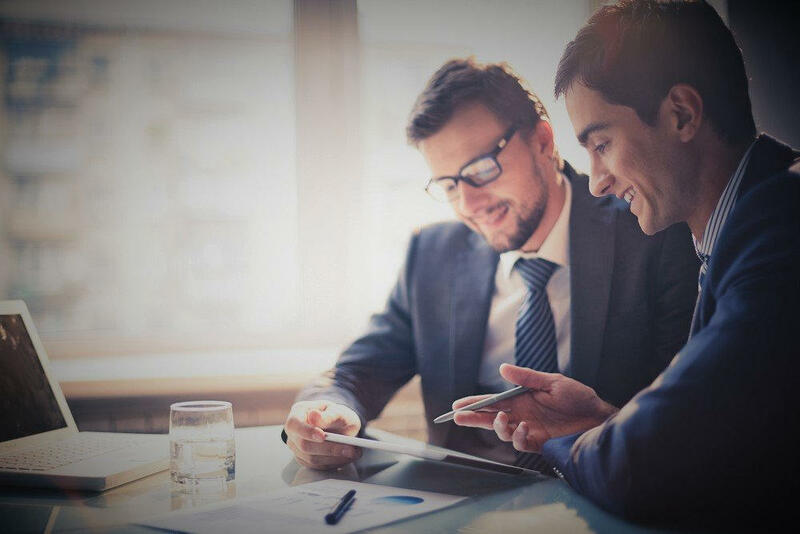 Should you decide to make this step, My Consulting Coach can help, offering a premium service to match you with coaches - each of whom is selected to have years of experience as a working consultant with a top firm. If you are a busy student or professional who wants to walk out of the interview room without regrets, check out our Mentoring Programs. At My Consulting Coach we strongly believe that your mistakes can be your best source of learning. After every case practice with us you'll receive the Performance Radar, a written report with feedback and scores for all key areas (Problem Solving, Structure, Communication, Numerical Agility). The scores will enable you to track your progress and the written feedback will help you pinpoint the areas where you should focus your efforts as well as those where you have improved. You'll always be in control.